Draft: 2008, Pittsburgh Pirates, 4th rd. Chase Jonathan d'Arnaud…he and his wife, Caitlyn, live in Long Beach, CA…his brother, Travis is a catcher for NYM…the brothers played together on the 2009 South Atlantic League All-Star team…his band, the Chase d'Arnaud Band, opened for Lady Antebellum in 2016 at the Verizon Wireless Amphitheater in Alpharetta, GA.
Was in the Giants' ML spring training camp as a nonroster player…opened the season at Sacramento (AAA), making starts at 2B (28), SS (20), 1B (13), 3B (4), RF (2), LF (1), and CF (1)…despite appearing in just 76 games, led the Rivercats in stolen bases (15), tied for 1st in triples (4) and walks (40), and placed 3rd in homers (12) and runs (54)…hit .327 (18-55) vs. LHP and .371 (23-62) with RISP…had a .338 (24-71) average in 24 games in June…was scheduled to start at SS for the PCL in the Triple-A All-Star Game at Columbus but was promoted to SF before that game. Was purchased by SF on 7/7 and spent the rest of the year with the club with starts at 2B (13), 3B (5), 1B (2), and SS (1)…did not commit an error in 83 TC with last miscue on 7/1/17 at SS vs. LAD…was 1-for-14 as a pinch-hitter…hit a ML high 3 homers, including a 1st inning leadoff blast on 7/11 vs. CHC…batted .300 (9-30) in his 1st 9 games through 7/24 with 3 2-hit games…had a .175 (11-63) average in final 33 contests, going 1-for-15 in last 10 games…tied a career high with 3 RBI, 7/30 at SD…pitched a scoreless 8th inning, allowing one hit in an 11-4 loss on 8/19 at CIN…was the 5th position player to pitch for the Giants in the SF era (Greg Litton, Dave Kingman, Matty Alou and Pablo Sandoval), the 3rd to throw a scoreless outing (Alou, Sandoval). Started the season with Atlanta, playing in 11 games before being designated for assignment on April 25 ... Was acquired by the Red Sox on April 27 and played in two games before being designated for assignment again on May 18...was acquired by the Padres on May 21 and appeared in 22 games, batting .143 ... Split time for the rest of the season between San Diego and El Paso (AAA)...batted .297 (51-for-172) in 45 games for the Chihuahuas. Spent the majority of the season - his eighth professional season, with Lehigh Valley (AAA)...appeared in 17 games for the Philadelphia Phillies in September ... Batted .268 with 28 extra-base hits, 35 RBI, 28 stolen bases and 77 runs in 120 games at triple-A ... Had his contract purchased on Sept. 14 and joined the Phillies for the remaining 18 games of the season ... Started four games for Philadelphia (.182, 2-for-11), three starts at shortstop and one at first base ... Started 117 of his 120 appearances for Lehigh Valley: 84 at shortstop, 31 at third base and two in left field. Spent the entire season with Indianapolis (AAA)...finished second in the International League in triples (9) and third in stolen bases (30)...appeared in games at second base, third base and all three outfield positions ... Had his contract selected by Pittsburgh on Sept. 2 and appeared in eight games through the remainder of the season. Suffered a broken left thumb while participating in a rundown drill during spring training on 3/9...Had surgery on 3/18 (Dr. Tom Graham) and began season on the 60-day disabled list...Began a rehab assignment with Class-A Bradenton on 5/16...Had rehab transferred to Double-A Altoona on 5/18 and went 2-for-14 in four games...Was transferred to Triple-A Indianapolis on 5/25...Hit .300 (6-for-20) with two RBI in five rehab games with Indy...Was recalled from rehab, reinstated from the D.L. and optioned to Triple-A on 5/31...Hit all four of his home runs in June...Was on D.L. with a left arm (elbow/forearm) contusion from 7/5-24...Made first career outfield appearance (left field) on 8/6 at Louisville...Made a total of 39 appearances at shortstop, 16 at second base, four in left field and one in center field (8/31 vs. Louisville) while playing with Indianapolis. Spent majority of season with Triple-A Indianapolis...Ranked second in the International League in stolen bases and ranked third among Pirates farmhands in that department...Made 88 appearances at shortstop, six at second base and three at third base with Indianapolis, where he was the Opening Day shortstop...Left the game on 4/7 after being hit on the helmet with a pitch...Was placed on the disabled list on 4/9 and missed a month of action...Returned on 5/8 and went hitless in four at bats...Went 3-for-6 with two doubles and five RBI on 6/3 vs. Syracuse...Was successful in each of his first 23 stolen base attempts before being caught for the first time on 7/13 against Columbus...Hit safely in nine straight games from 7/13-21, going 14-for-37 (.378) with five runs, six doubles, two triples and four RBI...Stole three bases vs. Buffalo on 7/28...Hit safely in each of his last nine games with Indy, going 19-for-39 (.487)...Went 4-for-5 with three runs and a game-winning double on 8/22 vs. Louisville...Had second four-hit game on 8/27 vs. Columbus...Was recalled by Pittsburgh on 8/28, but was optioned back to Triple-A on 8/31 without appearing in a big league game...Went 6-for-18 with a home run and five RBI in four games during the first round of the International League playoffs vs. Charlotte...Was recalled by Pittsburgh on 9/10...Pinch ran and played the final six innings at shortstop in 15-inning game on 9/10 at Cincinnati (went 0-for-2 at the plate)...Made lone start with Pittsburgh on 10/1 at second base and went hitless in four at bats...Did not record a hit in his six at bats with the Pirates. Began season with Triple-A Indianapolis and reached base safely in each of his first12 games...Batted .303 (10-for-33) with three multi-hit efforts in his first nine games thru 4/15...Went 15-for-81 (.185) with one multi-hit game in his next 23 contests thru 5/10...Hit .533 (16-for-30) duringan eight-game hitting streak from 5/11-18 and .410 (32-for-78) from 5/11 thru 6/10, raising averagefrom .219 to .297...Produced a .329 (26-for-79) average in 21 games during the month of May...Had fourhits and five RBI on 6/10 at Buffalo...Was selected to represent the USA in the MLB Futures Game but didnot play due to his promotion to Pittsburgh...Was batting .280 with Indianapolis when he was selectedby Pittsburgh on 6/24...Made Major League debut as a starter at third base on 6/24 vs. Boston and went1-for-3...Tripled off Jon Lester in third at bat; the first Pittsburgh player since Chance Sanford on 4/30/98to triple for his first big-league hit...Hit safely in his first three games and reached base safely in each ofhis first seven starts thru 7/1...Recorded first Major League stolen base on 6/29 at Toronto and tallied firstRBI with Pirates on 7/2 at Washington (game two)...Served as the club's leadoff batter twice; went 2-for-4on 7/23 vs. St. Louis and 1-for-4 with a double and two RBI on 7/24 vs. St. Louis...Was placed on 15-daydisabled list on 7/27 due to a fractured pinky finger on his right hand...Went 4-for-12 with a homer andthree RBI in four rehab games with Class-A Bradenton between 8/7-11 and 9-for-49 (.184) in 12 rehabgames with Indianapolis from 8/12-23...Was recalled from rehab and reinstated from D.L. on 8/25...Wenthitless in his first 11 at bats with Pirates after coming off D.L. before collecting two hits in his final two atbats on 9/1 vs. Los Angeles...Tallied second triple and had two RBI on 9/25 vs. Cincinnati...Was successfulin each of his first 11 stolen base attempts with Pittsburgh before being caught for the first time on 9/25...Had four hits and three RBI inhis final eight big league at bats and went 6-for-14 (.429) in his last seven games...Made 23 starts at shortstop and 10 at third base forthe Pirates...Hit .225 (23-for-102) with three RBI in 25 games with Pittsburgh before going on the D.L. and .195 (8-for-41) with three RBIin 23 games after being reinstated...Played winter ball in the Dominican Republic; appeared in just three games before having right handstepped on and missed remainder of season. Spent entire season with Double-A Altoona, where he made 111 starts at shortstop and 17 at second base...Was named to Eastern League mid-season All-Star team and captured MVP honors after hitting a grand slam in the contest...Shared leaguelead in at bats and ranked fourth in runs scored...Tied for league lead in triples and led team in that category - the fourth-highest totalin team history...Also led team in stolen bases and ranked fourth in the league in that department...Went 1-for-3 with a double and anRBI in first Double-A game on 4/8 vs. Harrisburg...Hit .205 in April and .211 in May and lugged a .209 batting average into the monthof June...Tied career high with four hits on 6/11 vs. New Britain...Hit safely in 10 straight games from 6/11-22 (15-for-44, .341) andreached base safely in 19 consecutive games from 6/1-22...Hit first home run on 6/22 vs. Portland...Batted .316 (36-for-114) in 27games during the month of June, raising season average to .250...Led off game on 7/31 at Richmond with a home run - the first Altoonaplayer to do so since Jim Negrych on 7/1/09...Hit .218 in July...Had another four-hit game on 8/7 at Harrisburg...Tripled twice and hadthird four-hit game on 9/4 vs. Reading...Hit three of his six regular-season home runs in his final 10 games...Batted .290 with threehomers and five RBI in eight games during the Eastern League playoffs...Homered off Andy Pettitte in Game One of the ChampionshipSeries on 9/14 at Blair County Ballpark. Ranked third among Bucco farmhands in batting average (.293) and stolen bases (31) while splitting season between Class-A West Virginia and Class-A Lynchburg...Began season with West Virginia and was named to South Atlantic League mid-season All-Star team...Made all 62 defensive appearances at shortstop while playing with the Power...Swiped three bases on 6/18 at Hickory...Was promoted to Lynchburgon 6/24...Had three hits and five RBI on 8/12 vs. Kinston...Went 4-for-4 on 8/29 at Winston-Salem...Made 26 appearances at shortstopand 25 at second base while playing with Lynchburg...Was named Mills Cup MVP after batting .308 with three doubles and seven RBI whilehelping Lynchburg capture the Carolina League Championship...Batted .296 (24-for-81) with five doubles, six RBI and a league-leading 13stolen bases in 20 games with Scottsdale during the Arizona Fall League (12 games at second base, six at third base and two at shortstop). Spent first professional season playing with State College and was named to New York-Penn League All-Star team...Tied for ninth in the league in stolen bases...Hit first pro homer and only one of the '08 season on 8/26 at Jamestown...Hit .398 (33-for-83) and reached base safely in 21 straight games from 7/21 thru 8/22; had four-hit game on 8/8 vs. Williamsport...Made 38 appearances at shortstop andfive at third base. April 16, 2019 Nashville Sounds activated 3B Chase d'Arnaud from the 7-day injured list. April 8, 2019 Nashville Sounds placed 3B Chase d'Arnaud on the 7-day injured list. 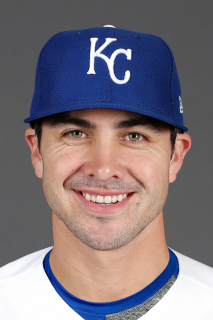 December 21, 2018 3B Chase d'Arnaud assigned to Nashville Sounds. December 17, 2018 Texas Rangers signed free agent 3B Chase d'Arnaud to a minor league contract and invited him to spring training. October 24, 2018 3B Chase d'Arnaud elected free agency. October 22, 2018 San Francisco Giants sent 3B Chase d'Arnaud outright to Sacramento River Cats. July 7, 2018 San Francisco Giants selected the contract of 3B Chase d'Arnaud from Sacramento River Cats. April 1, 2018 SS Chase d'Arnaud assigned to Sacramento River Cats from Richmond Flying Squirrels. March 23, 2018 3B Chase d'Arnaud assigned to Richmond Flying Squirrels from Sacramento River Cats. January 25, 2018 3B Chase d'Arnaud assigned to Sacramento River Cats. December 27, 2017 San Francisco Giants signed free agent 3B Chase d'Arnaud to a minor league contract and invited him to spring training. October 3, 2017 2B Chase d'Arnaud elected free agency. July 7, 2017 San Diego Padres sent 2B Chase d'Arnaud outright to El Paso Chihuahuas. July 4, 2017 San Diego Padres designated 3B Chase d'Arnaud for assignment. June 30, 2017 San Diego Padres activated 3B Chase d'Arnaud from the paternity list. June 27, 2017 San Diego Padres placed 3B Chase d'Arnaud on the paternity list. May 21, 2017 San Diego Padres claimed 3B Chase d'Arnaud off waivers from Boston Red Sox. May 18, 2017 Boston Red Sox designated LF Chase d'Arnaud for assignment. April 28, 2017 Boston Red Sox activated LF Chase d'Arnaud. April 27, 2017 Boston Red Sox claimed LF Chase d'Arnaud off waivers from Atlanta Braves. April 25, 2017 Atlanta Braves designated LF Chase d'Arnaud for assignment. May 2, 2016 Atlanta Braves selected the contract of SS Chase d'Arnaud from Gwinnett Braves. April 4, 2016 RF Chase d'Arnaud assigned to Gwinnett Braves. November 5, 2015 Atlanta Braves signed free agent 2B Chase d'Arnaud to a minor league contract and invited him to spring training. October 9, 2015 2B Chase d'Arnaud elected free agency. October 7, 2015 Philadelphia Phillies sent Chase d'Arnaud outright to Lehigh Valley IronPigs. October 7, 2015 2B Chase d'Arnaud roster status changed by Philadelphia Phillies. September 14, 2015 Philadelphia Phillies selected the contract of 2B Chase d'Arnaud from Lehigh Valley IronPigs. November 13, 2014 Philadelphia Phillies signed free agent 2B Chase d'Arnaud to a minor league contract and invited him to spring training. November 13, 2014 2B Chase d'Arnaud assigned to Lehigh Valley IronPigs. November 3, 2014 Pittsburgh Pirates sent 2B Chase d'Arnaud outright to Indianapolis Indians. October 2, 2014 Pittsburgh Pirates activated 2B Chase d'Arnaud. October 1, 2014 Pittsburgh Pirates reassigned 2B Chase d'Arnaud to the minor leagues. September 2, 2014 Pittsburgh Pirates selected the contract of 2B Chase d'Arnaud from Indianapolis Indians. March 4, 2014 IF Chase d'Arnaud assigned to Pittsburgh Pirates. March 1, 2014 Pittsburgh Pirates sent LF Chase d'Arnaud outright to Indianapolis Indians. February 24, 2014 Pittsburgh Pirates designated Chase d'Arnaud for assignment. October 12, 2013 Pittsburgh Pirates activated 2B Chase d'Arnaud. July 24, 2013 Indianapolis Indians activated SS Chase d'Arnaud from the 7-day disabled list. July 8, 2013 Indianapolis Indians placed SS Chase d'Arnaud on the 7-day disabled list retroactive to July 5, 2013. May 31, 2013 Pittsburgh Pirates optioned SS Chase d'Arnaud to Indianapolis Indians. May 25, 2013 Pittsburgh Pirates sent 2B Chase d'Arnaud on a rehab assignment to Indianapolis Indians. May 18, 2013 Pittsburgh Pirates sent 2B Chase d'Arnaud on a rehab assignment to Altoona Curve. May 16, 2013 Pittsburgh Pirates sent 2B Chase d'Arnaud on a rehab assignment to Bradenton Marauders. March 20, 2013 Chase d'Arnaud roster status changed by Pittsburgh Pirates. September 10, 2012 Pittsburgh Pirates recalled Chase d'Arnaud from Indianapolis Indians. September 3, 2012 Chase d'Arnaud assigned to Indianapolis Indians from Bradenton Marauders. August 31, 2012 Pittsburgh Pirates optioned Chase d'Arnaud to Bradenton Marauders. August 28, 2012 Pittsburgh Pirates recalled Chase d'Arnaud from Indianapolis Indians. May 8, 2012 Chase d'Arnaud roster status changed by Indianapolis Indians. April 11, 2012 Indianapolis Indians placed SS Chase d'Arnaud on the 7-day disabled list retroactive to April 9, 2012. March 15, 2012 Pittsburgh Pirates optioned SS Chase d'Arnaud to Indianapolis Indians. October 14, 2011 SS Chase d'Arnaud assigned to Toros del Este. August 25, 2011 Chase d'Arnaud roster status changed by Pittsburgh Pirates. August 12, 2011 sent SS Chase d'Arnaud on a rehab assignment to Indianapolis Indians. August 7, 2011 sent SS Chase d'Arnaud on a rehab assignment to Bradenton Marauders. July 27, 2011 Pittsburgh Pirates placed SS Chase d'Arnaud on the 15-day disabled list. Fractured little finger on right hand. June 24, 2011 Pittsburgh Pirates selected the contract of SS Chase d'Arnaud from Indianapolis Indians. June 2, 2011 Chase d'Arnaud roster status changed by Indianapolis Indians. May 23, 2011 Indianapolis Indians placed SS Chase d'Arnaud on the 7-day disabled list. April 6, 2011 SS Chase d'Arnaud assigned to Indianapolis Indians from Altoona Curve. January 18, 2011 Pittsburgh Pirates invited non-roster SS Chase d'Arnaud to spring training. March 8, 2010 SS Chase d'Arnaud assigned to Pittsburgh Pirates. August 1, 2009 Lynchburg Hillcats activated SS Chase d'Arnaud from the 7-day disabled list. July 18, 2009 Lynchburg Hillcats placed SS Chase d'Arnaud on the 7-day disabled list retroactive to July 16, 2009. June 22, 2009 SS Chase d'Arnaud assigned to Lynchburg Hillcats from West Virginia Power.